Having a sister in your life is a wonderful thing. Whether you want to thank her for her friendship, express your pride in her accomplishments, or simply let her know that you care, her birthday is a fantastic time to do so. 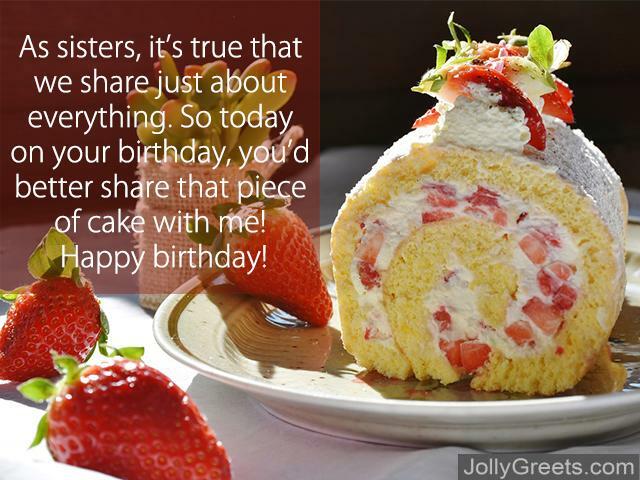 This article includes a diverse assortment of thoughtful messages to make your sister’s birthday exceptional. I’ll be lucky if I look as good as you when I get to be your age, sis. Happy birthday! When we were little, we couldn’t wait for our birthdays to come around. Now, you won’t even tell people how old you’re turning! Don’t worry, I’ll never tell. Happy birthday! Hey, sis, we’re both getting older, but I’m sure you’ll age gracefully. Happy birthday, here’s to finally growing up! My birthday gift to you? That sweater you borrowed from me last year and never gave back. Happy birthday, sister! As sisters, it’s true that we share just about everything. So today on your birthday, you’d better share that piece of cake with me! Happy birthday! A brother truly couldn’t ask for a better sister than you. Happy birthday, sis, I hope it’s the best one yet! As your brother, I promise that I will always be here to support you. You’re another year older, and I can’t wait to see the amazing things that are ahead of you. Happy birthday! Being your brother has made me a better person in so many ways. I’m wishing you the best birthday celebration ever, because you deserve it so much. Happy birthday! Your birthday only comes once a year, so I’m taking this opportunity to let you know how amazing of a sister you are. I’m so lucky to be your brother–whether we were playing outside or doing homework together, you were always by my side growing up. Even now that we’re older, I know that we’ll always be there for each other. Happy birthday! Every guy could use a sister like you to laugh with, learn from, and to tell them when their tie looks bad. I appreciate you so much and I’m incredibly proud of you. Happy birthday! I don’t know what I would have done without you all these years, big sis. You’ve been my role model, my teacher, my friend. Today’s your special day, and it’s time to celebrate just how amazing you are! Happy birthday! A big sister, especially one as incredible as you, is one of the greatest gifts that I’ve gotten in life. By your example, I learned how to be strong, hardworking, and, most importantly, how to fill my life with laughter. You’re not only an amazing big sister, but also an invaluable friend. Having you to look up to all my life has made me a stronger, more successful person, and I simply don’t have the words to adequately thank you. Happy birthday! My wonderful big sister, I simply have no idea what I would do without you. You’ve always been there to help me up when I fall, to be my shoulder to cry on, and to celebrate with me in the best of times. Today, we celebrate you and the amazing life you lead. Happy birthday! Younger sisters are always there to make you smile. 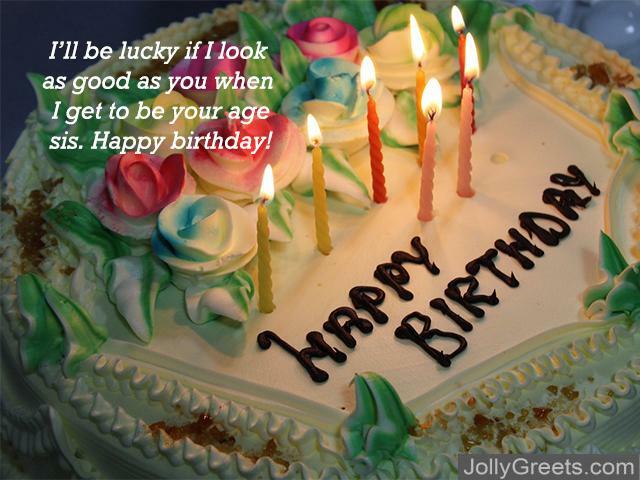 Make her birthday one to remember by giving her a loving birthday message, like one of the lines listed below. To have a sister is to have a friend for life, and I still remember how excited I was when you were first born. Now, all these years later, we celebrate your birthday, and I can’t help but get sentimental. You’ve been the greatest little sister I could imagine, and I can’t wait for the adventures yet to come. Happy birthday! My dear little sister, today on your birthday, I hope you know how greatly you are loved and how proud I am of you. I’m so excited to celebrate with you on this special day! You make me smile, you let me be myself, you are simply a joy. Happy birthday to my lovely little sister! Little sister, you have grown into a beautiful, intelligent, and charming woman. I’m so lucky to have witnessed your growth throughout our lives, and I can’t wait to see what your future hold! Happy birthday! It takes a special woman to marry my brother–your grace, class, and wit win over every person you meet. I couldn’t ask for a more wonderful sister in-law, and I’m wishing you the happiest of birthdays! Having you in our family is both a joy and a privilege; I couldn’t ask for a better sister in-law. Wishing you an incredible birthday and a fruitful year ahead! We may not be sisters by blood, but you’ve been a true friend to me since the moment we met. I hope that today on your birthday, you get all you want and more, because you truly deserve it. Happy birthday! I would never have expected my sister in-law to become one of my closest friends, but your charm, generosity, and simply beautiful spirit are impossible to deny. Happy birthday, I’m wishing you a year of happiness and success! 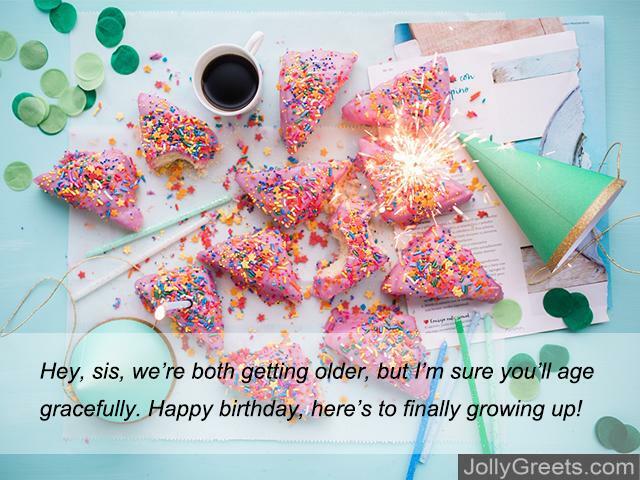 With one of the thoughtful birthday messages listed above, your sister’s birthday will become the perfect time to strengthen the bond you have with one another.